The Dallas Cowboys finally get to see what former Washington quarterback Isaiah Stanback can do, now that he’s finally healed from a foot injury and shin splints. Isaiah Stanback, the Cowboys’ fourth-round pick (103rd overall) in April’s draft, finally practiced Saturday for the first real time since he suffered a Lisfranc foot injury Oct. 17, 2006, as a senior at Washington. The team also knew Stanback’s recovery from foot surgery would take all off-season to heal, but figured the value of getting a potential open-field dynamo on the second day of the draft offset the time he would miss while rehabbing. Stanback said although he kept up with the mental aspects of the game and the new playbook while watching from the sidelines, the injuries have impeded his transition to receiver because he hasn’t had on-field training in the techniques of the position. In comparison, when the Cowboys transitioned Crayton from quarterback to receiver his rookie year, things came easier for the Northwestern Oklahoma State product because he only played quarterback as a senior, spending his three previous years catching passes. Stanback doesn’t have that luxury. While that may take some time, Stanback’s return to practice has already convoluted the roster picture at receiver. Because of his draft status and potential, Stanback would seem to be a virtual lock to make the team. But his inexperience means the Cowboys may need to keep an extra receiver. Sam Hurd and Miles Austin are likely to earn spots behind Terrell Owens, Terry Glenn and Crayton. Stanback would make six – the number of wideouts the Cowboys kept last year. Does the hard-charging Jerheme Urban, one of the biggest preseason standouts, get a spot too? Keeping seven wide receivers might be a tad much. 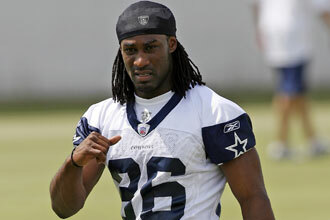 Frankly, the Cowboys should keep the best 54 athletes, period. Keeping two kickers, mediocre backup nose tackles, barely ready for prime time fullbacks, and the like on the roster is just a waste. Keep all the tight ends, linebackers, and wide receivers who have a chance to be special and then figure out how to cover thin spots with the great athletes. That’s especially true, I think, at wide receiver. Terrell Owens and Terry Glenn are both 33 years old. This could well be the last season for one or both and there’s certainly no guarantee they won’t lose some playing time to injury. The Cowboys need to figure out what they’ve got talent wise at the position sooner rather than later so they know what they need to do in free agency and the draft next year.